What Is the Natural Incubation Process of Chicken? The full incubation period for an egg, from laying to hatching, is 20 to 21 days. During this time, a hen sits on her egg(s) and maintains a temperature of around 100 degrees Fahrenheit. This temperature is needed to ensure proper embryonic development. Within the first 24 hours, the egg shell hardens, the egg is laid and the primitive streak is formed. This is the first sign of development in a chicken embryo. By the second day, the somites begin to develop; somites are the divisions of the body. In a chicken embryo, brain, eye, tail, wing and leg somites appear. 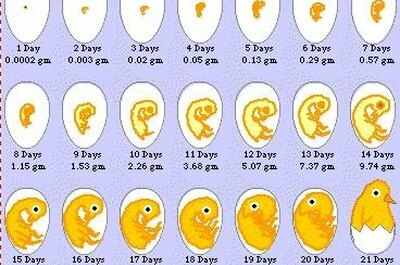 By the end of the first week, elbows, knees, toes and beaks are formed in the embryo. Eyes gain their pigment, and the feathers begin to form. During the second week of incubation, everything lengthens. Toes get longer, and beaks get bigger. This is also when webbing develops between the toes. The beak continues to grow until it reaches its mature size for hatching around Day 18. The third toe also reaches its full length on the eighteenth day. By Day 20 to 21, a chick breaks out of the egg shell, thus ending the incubation period. What Is the Hanging Skin Part Under the Rooster's Neck?